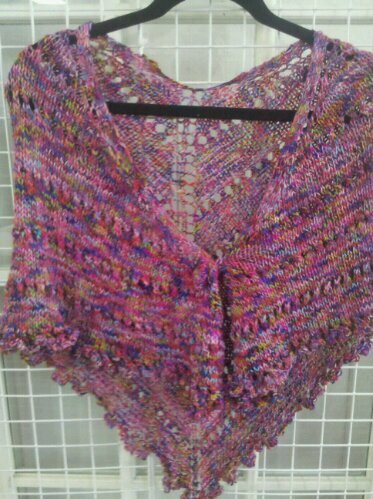 Remember the Ruffle Shawl class starts mon.10-12 or 6-8 pm. Cost $25. plus materials. The Spring Store retreat was a great success, and I think everyone had a good time! The Fall Retreat is sceduled for Oct 7-9, so mark your calendars! We are taking sign-ups now! Well I survived the 8th grade trip this weekend. I joined Kate and her 25 classmates on a trip to Cincy. We started at 8 and by 10 the bus had broken down and we had to shuttle kids in cars to the hotel. We then proceeded to Kings Island which was a lot of fun, but a bit crowded. Kate and a couple friends rode a ride that straps you in a harness (3 girls), then pulls you back up in the air a couple hundred feet (or so) and then you pull the strap and swing forward and backward! It looked like alot of fun, but a little nerve racking for the parents! The girls loved it! Sunday we went Zip Lining. I HAVE NEVER BEEN SO AFRAID IN MY LIFE!! The kids and some of the adults had a wonderful time and some of us swear we will never do that again!! Thurs, may 5th:5-8 pm: OPEN KNITTING- all are welcome to come and knit! 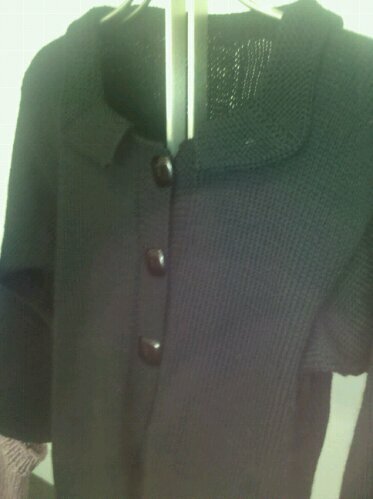 Tues, may 10th: Quonset Cardigan-(check out photos from blog date May 3)-6-8 pm. I knit this with Berroco Weekend Chunky, but the pattern can also be done in an aran weight. All Seasons or Samoa would be great for the aran weight version. You can do either weight for the class ( the chunky just knits faster!). Thur, May 12- Scarf Knit Night- 5-8 pm. Sarah Burton (many of you have seen her wonderful Mosaic Patterns) is coming in for Super Bowl Scarf Knit Night!! Yeh! 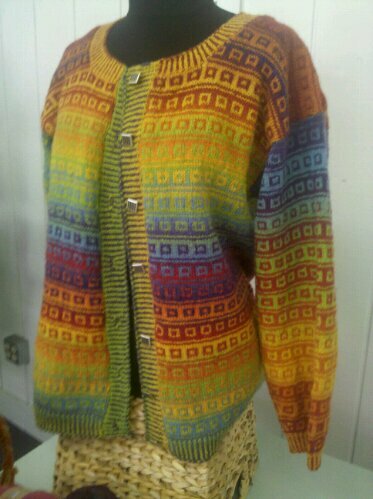 She is bringing us a pattern to knit. 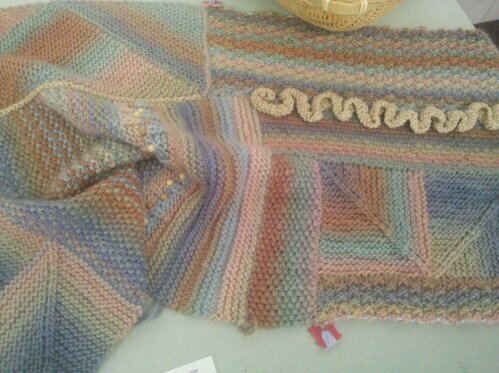 You can also knit your existing scarf patterns if you want to, but I would reccomend coming to see some of her designs. She is truly amazing! 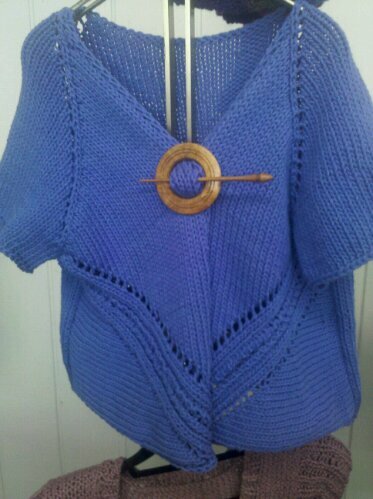 Sat may 14- Ravelry 12-4pm. All are welcome to come in and knit with this fun group!! Sat May 14 OVERNIGHTER 7:30 pm -? Cost $20. plus a small snack to share. I will get Pizza and drinks.